In this post about GoDaddy 1 dollar coupon, we’ll show you in simple steps (with illustrations) how to build your own website on GoDaddy for just $1 per month, and get a free domain name of your choice. 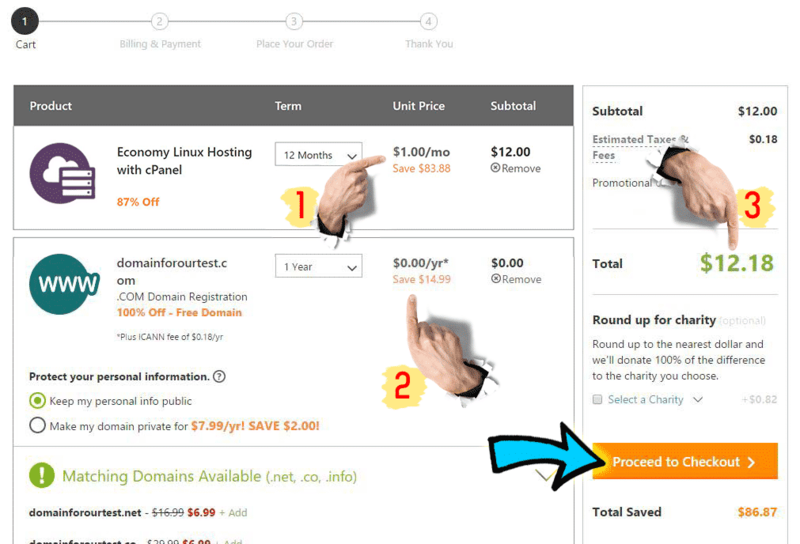 As you can see, using this GoDaddy 1 dollar promo, you can host 1 website on your plan that will have 10 GB SSD space. The 25, 000 visitors is more than enough because it is counted per unique IP address per 24 hours period. So if the same visitor accesses your website 50 times on the same day, it will count as 1 visitor not 50. The visits by Google bots or search engine spiders are also not counted. In my opinion, your website will most certainly never require all that much resources. If you are a blogger or anyone trying to establish online presence with a website, this 1 dollar GoDaddy plan is a great place to start. Note: Advanced users, if you wish to host your GoDaddy’s domain on a different web host, simply change the nameservers in the domain manager in your GoDaddy account. It does not cost any money. 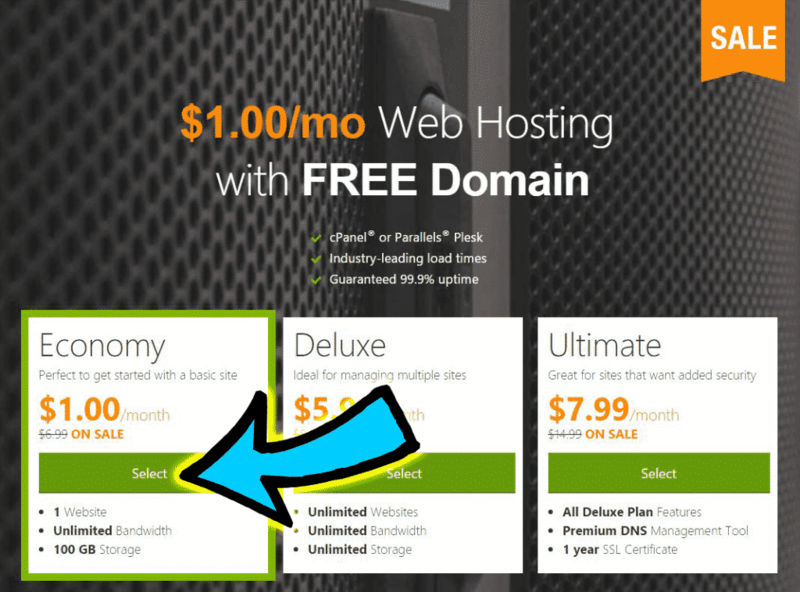 To get a free domain name and Economy web hosting for $1/mo, follow along these simple steps. We have included pictures so it should be a very straightforward process. However, if you have queries, feel free to leave your questions below in the comments section. After you click on the promotional offer above, it will take you to GoDaddy’s website where you might notice this image that indicates you have activated an offer. It will specifically be written on the top (in orange color) that the offer is for 1 dollar per month hosting and a free domain on GoDaddy. After you click on the offer link above, it should show you this page on GoDaddy’s website. Select the Economy plan. Select 12 months on the next page. Scroll below. Click continue. This is the step where you have to choose your free domain name. The domain name has to be available (not already bought by anyone else) for you to register. Press Go when done. Add and continue if you’re happy with the domain of your choice. This is the most important step. Here, make sure that your cost is $12.18, nothing more than that. Check this image below and ensure that everything is set up the way they’re supposed to be. #2 The domain is for free so it should cost nothing. You have to select it for 1 year in the drop down to make it free. #3 Total cost should be $12.18. 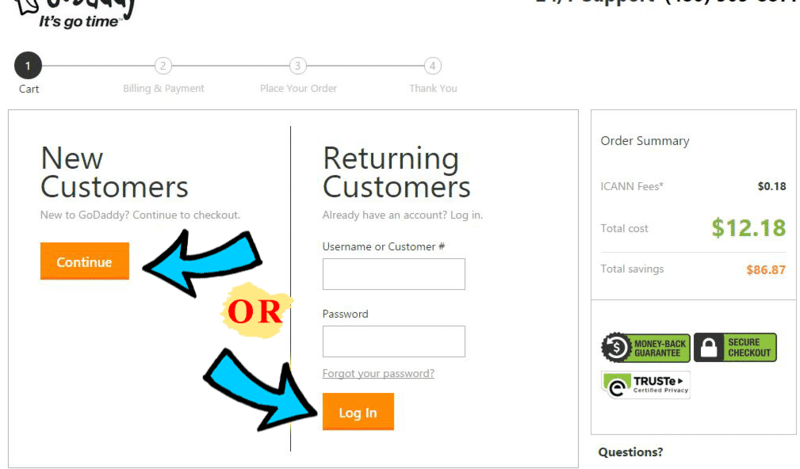 Click on the orange button “Proceed to checkout” if everything looks good on your screen. Don’t worry you can come back to this page before final payment. For the offer to be activated, you should be a new customer. You can create a new account. OR you can try to login if you are a returning customer and experiment whether the offer works out. Registering as a new customer is the best way to do it. It is straightforward and you will not need directions on that. It’s easy. After you register as new customer, you’ll be brought back to step 5. Now you can proceed and pay GoDaddy $12 for the 12 months. You’ll get unlimited economy hosting plan and 1 domain that you chose. After you check out, GoDaddy will send you a confirmation email about your domain and hosting purchase. When you log into your GoDaddy account, you’ll see the domain name there registered for 1 year. Congratulations! You should now be on your way to create your new website! If you have any questions regarding our GoDaddy 1 dollar hosting, feel free to drop them in the comments section below. Godaddy my fav. Hosting provider, All my blogs/sites @ Godaddy Windows shared hosting. Recently i purchased a new plan and got a free domain with a big discount on hosting, $1 per/mon economy it’s a super deal, even students can afford easily and the best part is unlimited bandwidth. GoDaddy has an excellent servers, 99% uptime guarantee. It is 1$/mo for the first annual year which is a cool deal. If you want to save money in long run you should pay 2 or 3 years upfront so that the deal applies. But 1/mo is one of the lowest out there. Can’t complain since I got the domain (worth 15$) free from my annual hosting plan. If I ditch the hosting for some reason the domain will stay with me for zero additional money. Thanks for this deal!